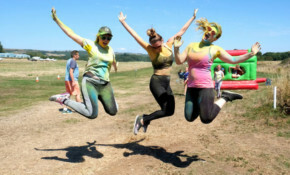 Following last summer’s successful Inflatable Rainbow Run, the event will return to Sandown Airport this July. Police are still carrying out enquiries to establish if any other vehicles were involved, or whether this was a single vehicle collision. Please get in touch if you know anything that could help. A good chunk of government funding is now making its way to the Isle of Wight to kick-start a new micro brewery. The RNLI are seeking to move the lifeguard station on Sandown Beach and place it in a permanent position to save costs of removing and returning it each year. Island Roads say it's impossible to undertake projects of this scale without some localised disruption and they hope that residents feel the short-term inconvenience will be outweighed by the long-term benefits of this upgrade. The results are in and according to Visit Isle of Wight the Island's shortlisted entries in the Countryfile Magazine competition by a massive margin. The Hurricanes regained second spot in the Hampshire Premier table, following last week's defeat to Bognor RFC who had overtaken them. Head to Dinosaur Isle in Sandown this Sunday for a full day of free family fun, lots of activities and displays including IW Bat Hospital, IW Metal Detectorists and Brading Roman Villa. Space in the Broadway Centre car park - for the entourage of scooters expected at the funeral of Malcolm Butcher next week - has been refused by the town council, but a possible solution to diffuse the situation has been found by Cllr Ward. Stunning Sandown beach and beautiful Bembridge village are both in the running for Countryfile Magazine Awards but are reliant on public votes. You have until Sunday to show your support. The purpose of the sand snowman event is to encourage people to head to the Bay in winter and remind them that it’s an extraordinary place worth exploring. The Micro-Eye is coming all the way from New Zealand and is a very tough bit of kit, designed to be safe and easy for any age and so will be accessible to all of our thousands of visitors.